You might go to Google Earth to look up something specific—your house, your next vacation spot or close-up pictures of elephants in Africa, for example. Or sometimes you might just feel like wandering the earth, diving in to find out more about a particular location or topic. But where do you start? 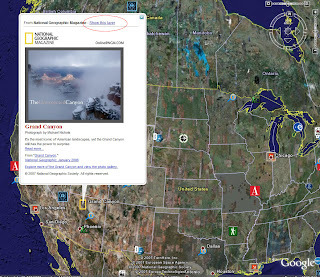 There's so much fascinating content in Google Earth created by partners like National Geographic Magazine, the Jane Goodall Institute and NASA that it can be hard to get going. We're happy to announce that we've added a 'preview' layer, a selection of placemarks that highlight our many content layers, to help make this exploration easier. It's a new, easy way to see what's out there without getting overwhelmed. Say, for instance, you're exploring the southwestern region of the United States, and you click on a National Geographic placemark over Arizona. And then, after reading about the Grand Canyon, you get curious about what other photos National Geographic has of the region. Just click on the 'Show this layer' link at the top of the bubble, and you'll be able to explore this area more fully. And here's what you'd see after clicking on the 'Show this layer' link. 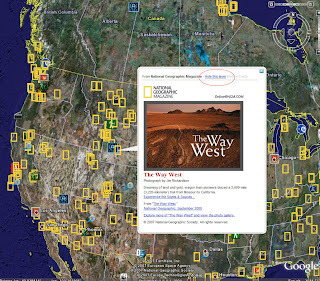 When you're finished looking, you can click "Hide this layer" and the National Geographic icons will disappear.